The Green Values Club - A book for young people eight to eighteen! This resource is dedicated to the Earth in honour of the United Nations Conference on Sustainable Development which took place in Rio de Janeiro, Brazil, in June 2012. Rio+20 is a reference to the 20 years that have passed since the first UN Conference on Environment and Development in Rio in 1992. Living Values Education leaders around the world are concerned about our Earth and her ocean. We would like to offer educators, parents and youth facilitators around the world these Living Green Values materials with the hope that the stories and activities will be useful to you in educating children and young adults, families and communities to internalize the importance of living sustainable lives and caring for our planet. May we all learn to live in harmony with nature and with respect and care for all. Let’s spread the word about the need of our Earth and her oceans! Are you with an environmental organization? Download the Living Green Values Activities book, (below), and distribute them to teachers in your area – or print the storybooks and distribute them to young people! Create a link to this page and we will put up a reciprocal link to your environmental organization. Make the activity books available to educators and youth groups and the storybooks to children! Contact us - Click here to email to obtain the right! Let us know what you are doing to help the environment! Did your children like the stories? Allow them to share their thoughts, creations and actions as a Friend of the Earth. Download books and cover images free of charge, with the links below. The Activities for Children 3 – 7 include stories, a visualization and activities. The “Rosa, David and a Tern” stories are included as well as “A Tap that Cried”. 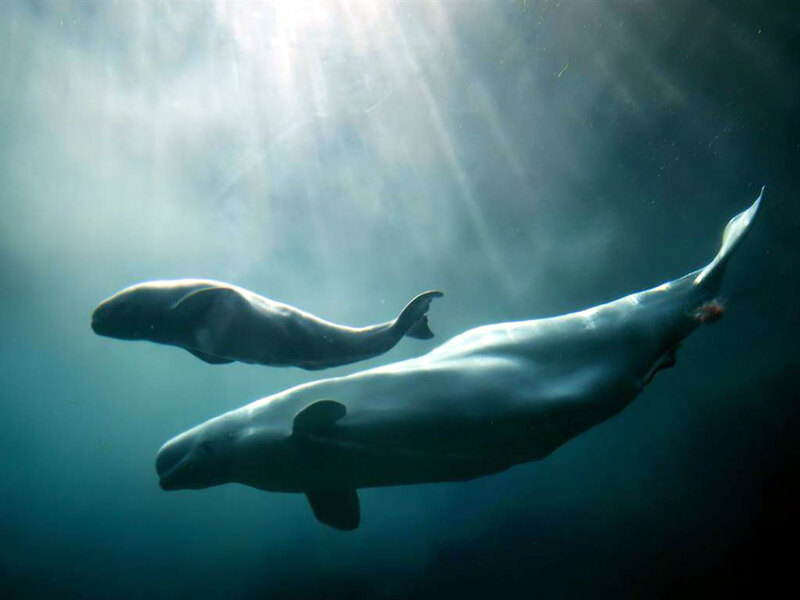 In the Activities for Children 8 – 14 and Activities for Young Adults, specific scientific information is included about the harmful effects of human actions on the ocean, rivers, animals, air and ground — and on human beings themselves. 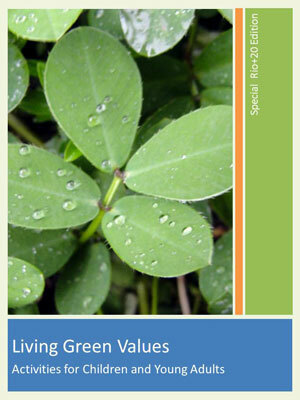 This information is first presented through a series of stories called the “Green Values Club”. The nine stories weave in the values of love and respect, camaraderie and helping others, and the understanding that each one of us can make a difference. Cognitive understanding of the effects of one action is amplified through an explanation of systems thinking and students charting effects with flow charts and mind maps. Educators can help empower students to take positive action and do service-learning projects through the activity ideas presented. Please add your own ideas and help them do what is most needed in the local community. A relaxation/focusing exercise is included at the end of many lessons to help the students feel safe and peaceful. Further activities and relaxation/focusing exercises can be found in the Living Values Education Activities books. Enjoy doing the activities with the students! If you wish, we will be happy to post your activities and news of your outcome in our newsletter or the international website. Thank you for helping take care of our Earth. 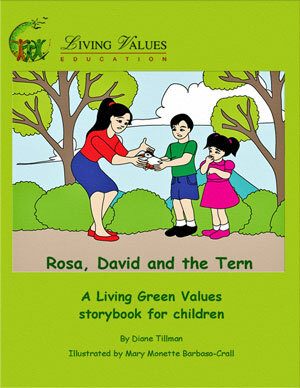 “Rosa, David and the Tern” contains three chapters about two young children who help free a little Tern. Their happiness at helping turns to amazement, discovery, action and joy as the Tern and a Blue Heron speak to them on behalf of the Earth. A delightful tale which helps children explore how they can help care for and respect the Earth, her ocean and its creatures. 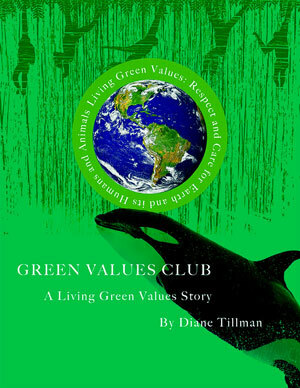 The “Green Values Club” contains nine chapters. The story begins as Katie and George worry about their father not returning the night before. As they head out in a dinghy with their mother, they find him and his partner trying to free a whale caught in a net. Their adventure unfolds at the beach, school and city council as they learn with their friends more about the Earth, her ocean and how humans have affected the planet. The values of love and respect, camaraderie and helping others are evident in the story as is the message and reality that each one of us can make a difference. We are delighted you wish to use these resources. While you may download them free of charge, should you be able to, a donation to our organization would be most appreciated. Living Values Education Workshops available around the world! As with all Living Values Education activities, we encourage educators, facilitators and parents to participate in an Living Values Education workshop to learn more about creating a values-based atmosphere and the importance of being an example who models the values. But it is not necessary to do these activities! Please contact your country’s ALIVE Associate or Focal Point for Living Values Education should you be interested. You can find their contact details on the Country page. We are each an inspiration to one another as friends, communities and as nations. We are all sisters and brothers, interdependent upon one another and blessed with a common humanity and common inheritance that comes together in trust, respect and reverence for all nature and the world in which we belong. We are not only citizens of our nations, not only citizens of the United Nations, but citizens of one global nation. "Humankind has not woven the web of life. We are but one thread within it. Whatever we do to the World, we do to ourselves. All things are bound together. All things connect. Whatever befalls the Earth befalls also the children of the Earth". We are each, every living form, every person and especially every child linked to each other. Together we understand, together we learn, together we heal and together we build. Let us learn from the past, understand where we are now and build a caring future in faith, hope and with love in which it will be our privilege to unite. Passive acquiescence of the status quo is not enough. Belief and behaviour go hand in hand. Our World, our people, our animals, our birds, our plants, our land, our seas and our air need to feel happy in their home. We, the peoples are the stewards of our fragile planet. The caring impulse in us must be developed to help change the attitudes of those who knowingly and ignorantly hurt and exploit. Within our lifetime – we need to reaffirm our vision for peace and hope, and discover a new and caring relationship with the rest of the living world. We need to nurture the caring impulse in us all to help see our responsibilities more clearly and give us initiative, commitment and determination to fulfil them. On that, we can and must depend. We are all indeed an inspiration to one another – as friends, as neighbours, as people, and as nations, and for that we should give thanks in faith, in hope, with love and in peace.